Design based on classic lever and grip, the legendary smooth lever action is based on the idea of mechanical advantage. As pressure is applied at one end of the lever handle, power is multiplied at the corkscrew, making it easier to open the bottle with one fluid motion. Step 1: Swing lever to full open position and put opener over the bottle. Step 2: Grip the bottle neck firmly with the grip handles. Step 3: Slowly bring the lever up to the closed position. Step 4: The spiral has been driver fully into the cork. Step 5: Slowly lift the lever back to the opened position. Step 6: The cork has been pulled out of the bottle successfully. Please read the instruction manual on the box before using it. The sharp spiral can go into the cork when going down and pull the cork out in a second when going up. 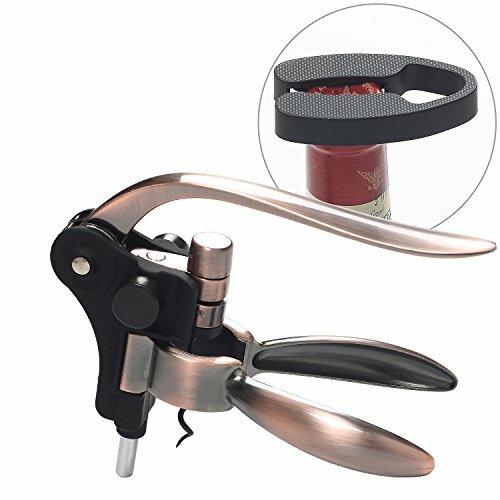 Great Application: The rabbit original lever corkscrew is great for any size of wine bottles in Home, Kitchen, Restaurant or Bar. Material: Zinc alloy material with plating, durable and attractive. The design is accordance with human engineering. Easy to Use and Save Effort: Easily removes wine corks in just three seconds. Modern Gift Package: Packaged in a classic black gift box ideal for gift-giving and storage for wine lovers. Includes in the Box: A rabbit opener (Bronze Handle), a convenient foil cutter and extra corkscrew spiral.